Citibank provides different varieties of loans to fit the needs of different stages of life. Citibank loans help meet the financial needs of a diverse group of customers. The loans are well-designed in view of the requirements of the customers and help them grow, overcoming the financial hurdles. The different types of loans provided by Citibank are: Personal loan, Home loan, commercial loan, ready credit, Paylite – loan on your card, loan against securities, loan against fixed deposits, loan for commercial vehicle and construction equipment. Obtaining the loan and managing the loan payments is simple and easy with Citibank online services. Loan EMI can be paid online with the account linked with the loan. A Citialert can be planned to remind you of payment of the loan EMI before the due date of every month to avoid penalty. Standing instructions can also be provided to automate the loan EMI payment every month. Provide the required personal details in the application and click the talk to us now button. Depending on the details provided, the customer will be given information related to the loan eligibility in just 4 hours. Loan application process is so simple, that the customer does not have to provide any documents, income proof or the address proof for knowing the eligibility for a loan. Check the loan terms and conditions before going accepting the loan amount. If you have any doubts regarding loans you can contact Citi Bank Customer Care at any time. Citibank is not providing student loans from April 22, 2017. Hence, students in need of student loan can contact other banks like ICICI or SBI to continue their education without hurdles. Individuals planning to purchase a new home, renovate the existing house, or shift their home loan to Citibank can get it accomplished very easily without worrying about the expenses by availing the Citibank home loan. 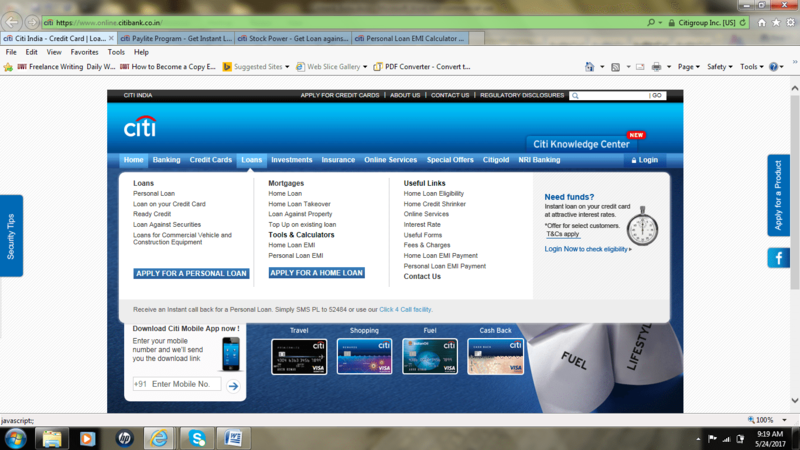 You can check the home loans using Citibank Internet Banking. Citibank provides three types of home loans – homes loans for those planning to purchase a new home, home loan for those planning to transfer the existing loan to Citibank, and home loan against a property. Home loans for new homes will be provided for purchasing a house under construction or a completed house. The advantages of home loans are low interest rates, loan availability for up to Rs.10 crore, larger repayment tenure of up to 25 years, loan amount equivalent to 80% of the property value. The loan will be provided without the presence of a guarantor. The interest on the loan will be calculated on the reducing balance, so more of the installment paid will move to the principal amount. The advantages of transferring the existing loan to Citibank are the high price home loans can be transferred Citibank for an amount of up to Rs.5 crore. A payment tenure of up to 20 years is provided. However, the transfer process takes place only on the basis of your loan repayment record with the previous bank such as SBI, ICICI etc. In the case of availability of surplus funds, the amount can be deposited in the bank, lowering your interest rate. Before applying for the loan or transferring the loan to the Citibank, customers can check for the EMI they have to pay monthly after the loan is sanctioned using the home loan EMI calculator. This highly beneficial tool can be accessed by clicking the Home loan EMI calculator listed under the loans tab. Click loans – under tools section select the home loan EMI calculator. Details to be provided for loan EMI calculator are – loan tenure, interest rate, and the loan amount. Then click the calculate button to obtain a rough estimate of the home loan EMI. A manageable EMI can be reached by adjusting any one of the parameters such as the loan amount, tenure or the interest rate. Obtaining a Citibank personal loan of about Rs. 30,00,000 is very simple with less documentation and faster approval. A personal loan can be obtained for any of the needs such as medical emergency, celebrate a wedding or for any other reason. The loan amount will be deposited in the bank account within just 48 hours. The interest rate is fixed and the customers are provided the flexibility to make the payment every month. Customers are suggested to use the loan EMI calculator for a rough estimate of the monthly EMI to be paid so as prevent themselves from being overburdened. The minimum amount of personal loan that can be obtained is 1,00,000 while the maximum limit is 30,00,000. The minimum duration for which the repayment option is not available is 12 months. Afterward, the maximum duration of loan payment is 60 months. A booking fee of 2.5% will be charged on the loan amount. Customers willing to pre-closure the loan should pay up to 3 percent of the total principal amount as the fee for pre-closure of the loan. You can also use the Citibank Mobile App for checking the loan status. Citibank provides other types of loans such as the commercial loans for customers from the business sector. Small scale or corporate industries can apply for a Citi commercial loan. Different types of commercial loan offerings such as overdrafts, export and import finance, short term and long term loans are designed especially for the business community. The advantages of Citi commercial loans are: the interest rates are as determined by LIBOR (London Interbank Offered Rate, is a benchmark rate that some of the world’s leading banks charge each other for short-term loans), Low interest rates on short-term loans ranging up to 6 months, and sanction of loan amount equivalent to 80 percent of the business properties showcased. Another type of loan that is useful for the business community is the loan for commercial vehicle and construction equipment. Loans for a commercial vehicle or construction equipment will be provided for the purchase of a new or a used commercial vehicle including the construction equipment. The interest rates are comparatively low and perfect even for small scale businesses. Fixed interest rates make money management easy for the entrepreneurs. The loan covers all types of commercial vehicles and construction equipment. Above all, the loan can be obtained quickly without any delays. Citibank provides loans against fixed deposits for those planning to cancel the fixed deposit early before maturity. The loan amount equivalent to 90 percent of the fixed deposit value is provided to the customers. Loan against fixed deposits can be obtained quickly and easily. The interest rate will be charged only when the customer uses the loan amount. The loan amount will be provided on all the deposits related to the household members. The minimum amount of loan that can be obtained against fixed deposits is limited to Rs.1 lakh. Compare the Loan Interest Rate of Bank of Baroda with other banks like IDBI Bank Loans, HDFC Bank Loans, ICICI Bank Loans and Canara Bank Loans. 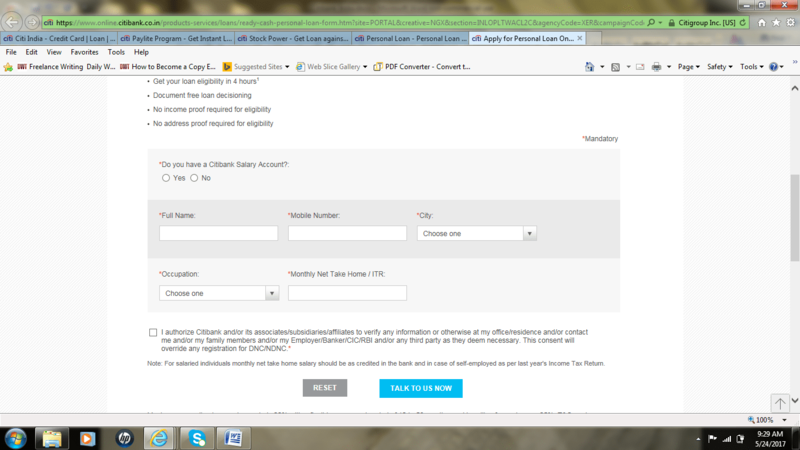 Who is eligible to obtain a Citibank loan? Individuals aged 23 years and above with at least 2 years of work experience are eligible to obtain the Citibank home loan. 2. Is it possible to obtain a pre-approval for the loan and avail it at a later date? Yes, depending on the ability to repay and the salary, the customers can get a pre-approval for the loan amount. However, the final sanction will be made only if the chosen property meets the standards laid by Citibank. 3. How to repay the home loan EMI? Home loan repayment can be made by providing standing instruction on the Citibank account. 4. Is loan prepayment option available for home loans? Home loans can be pre-paid. However, the pre-payment involves certain terms and conditions. Contact the branch to know detailed information on terms and conditions of prepayment. 5. What is the advantage of taking the home credit? Depositing the extra funds possessed by the customer into the home loan accounts helps lower the interest rates as the interest rate is calculated on a daily basis. The extra amount transferred to the loan account automatically lowers the principal reducing the payment. The home credit account is similar to any online banking and can be used to withdraw money, make payments, and use the ATM services. 6. How can a personal loan be used? A personal loan can be used to plan any of the works such as planning a wedding, repay multiple small loans and consolidate them into a one single big loan, or for home improvement. However, it is mandatory that the loan should not be used to purchase gold including the ornaments, coins, trade funds or the gold mutual funds. Similarly, the loan amount should not be used for anti-social activities. 7. When to start the repayment of the personal loan? The loan repayment process begins from the second month after booking of the loan. For example, if the customer is sanctioned the personal loan in the month of October, then the loan repayment begins from the month of December. 8. What does the term top up loan mean? Customers in need of additional finance even after using the first loan can choose the top-up loan option. 9. How to top up the loan? Existing customers of Citibank can obtain the top up on their loan by submitting the filled application that is available in the click 4 call tab. 10 What is the difference between the unsecured loan and the secure loan? A secured loan is a loan provided against a security such as an asset. An unsecured loan is a loan that is provided without taking any security. Loans such as personal loans and credit cards are unsecured loans. 11. What is a fixed interest rate loan? A fixed interest rate loan is the loan with a fixed interest rate throughout the loan tenure. The interest rate on the fixed interest rate loans does not change over a period of time, even if the loan rates suggested by the RBI change. This is the best-recommended loan for those with fixed income which forces them to plan their expenses cautiously. 12.Does Citibank use the credit rating information before granting the loan? Credit rating information is calculated using the information related to the employment history of the customer and the way the Citibank accounts are being managed if the customer holds any Citibank account. Citibank uses the credit rating provided by CIC which makes note of the loans taken and the way the repayments are made within the tenure period and no penalty. Customers who have missed the repayments will have low credit rating making them ineligible for the Citibank loan. Hence, the customers are suggested to obtain the credit rating from CIC before applying for the loan to ease the loan processing. 13. Can a Citibank personal loan be pre-closed at once? The loans taken after or on October 2015, can be pre-closed with complete payment of the standing loan amount. However, the pre-closure is allowed only after paying the first 12 installments. Loans booked before October 1, 2015 can be closed by making the full payment of the standing amount after making payment of the first six installments. Customers planning to make the partial pre-payment of the loan amount can do only after the first 12 months of booking the loan. For loan pre-closure, customers can use the Citi phone banking services. 14. What is eligibility for obtaining a loan against fixed deposits? Customers above 21 years of age with sole proprietorship firm or partnership with other firms. Customers working as stock brokers are also eligible for obtaining a loan against fixed deposits.